Quoizel Lighting Fusion Collection Interior foyer piece chandelier in transitional style, has voltage rating of 120-Volts and power wattage of 240-Watts. This chandelier has a dimension of 16.75-Inch x 16.75-Inch x 19.75-Inch. It incorporates four 60-Watt B10 incandescent lamps with the help of candelabra socket. 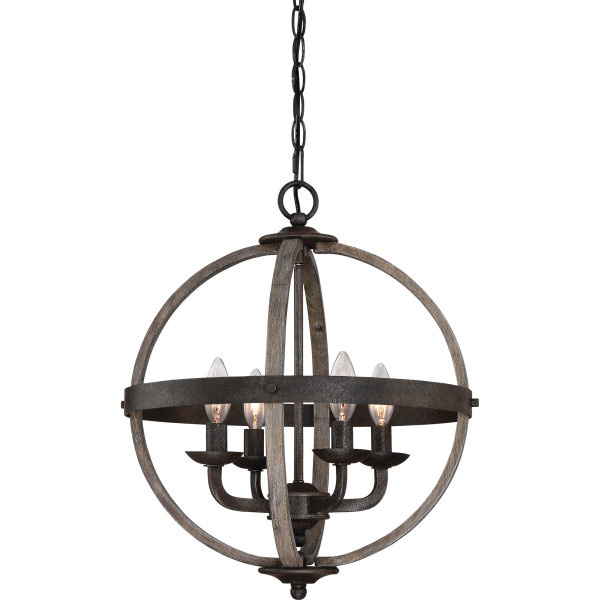 This ceiling mountable dimmable chandelier features steel-wood construction with rustic black finish. It includes 5.5-Inch Dia base backplate, 8-ft chain and 12-ft lead wire. This chandelier is great for damp locations. Chandelier is ETL listed.